May hasn't been the best month for me in my motherhood journey. Yes, even if I don't always pen it down, the truth is that I face all of the parenting challenges, just like you do. I had to deal with exhaustion from solo parenting, handle backtalk and rude behaviour, suffer meltdowns and tantrums, be annoyed by sibling rivalry, get frustrated over the never ending chores, think of new ways to discipline and teach my kids because whatever I was doing didn't seem to be working too well. There were even times when I felt like I needed to take refuge in the loo and even a 5-minute break was a welcome retreat. 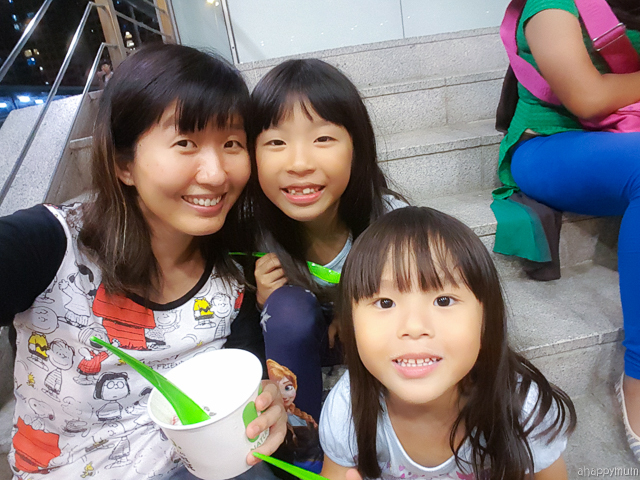 There were also nights when I felt so tired that I fell asleep with the kids and gave up on blogging, and even brushing my teeth. 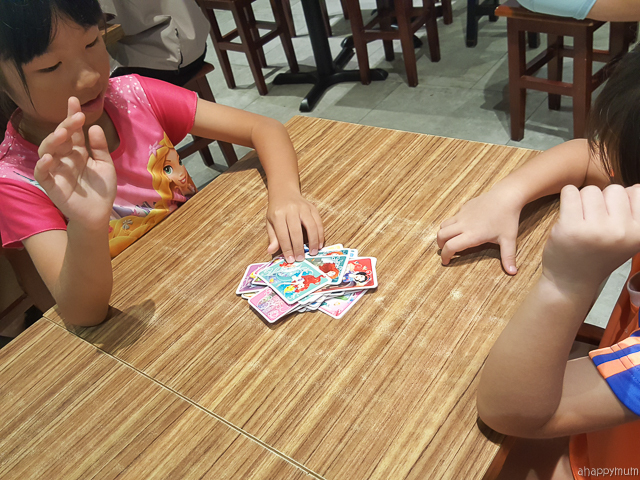 There was also one occasion when I felt so overwhelmed by the huge headache that the primary schooler was giving me and told the hubby to settle it while I hid in a corner. Yup, not proud of it but that is the truth. 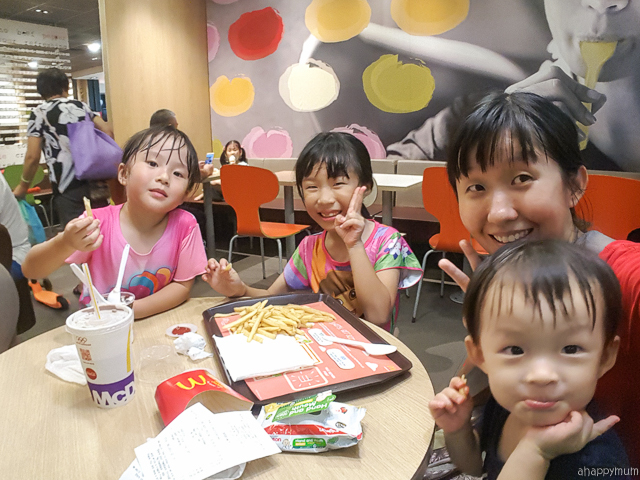 I always knew handling three kids on my own wasn't going to be easy and while it really isn't, I know that we will get through the challenges together as one. What I didn't expect was that while I could handle a needy toddler and a middle child who is finding her place, what I am finding hardest to manage is the overly strong-willed firstborn who is asserting her independence and testing my limits every single day. Didn't they tell me that it will all get better when the babies grow up and you don't have to handle soiled diapers, endless crying and night feedings? Well, I'm thinking it never does get better and every phase of their growing up will just present a whole new set of challenges for us. That said, for every down in my motherhood journey, there are the ups as well and these are the moments that keep me strong and motivate me to go on fearlessly. Life has never been a bed of roses and I believe that every hurdle is there to teach you something valuable, to remind you of what matters, to make you cherish all the little bits and pieces of joy you have. 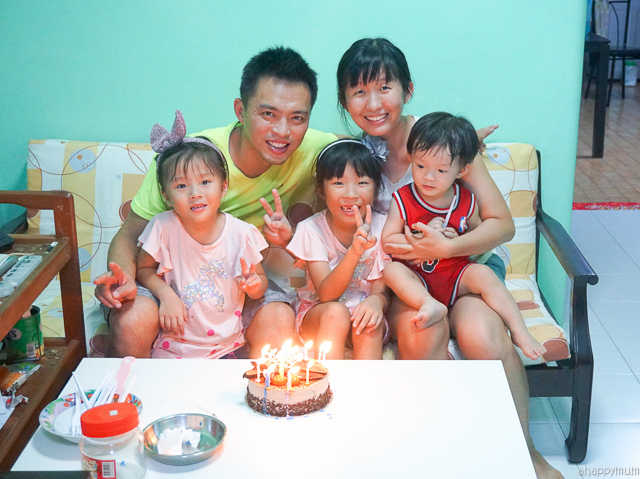 In May's "Happiness is..", it's about riding out the storm and focusing on the happy moments that we share as a family. 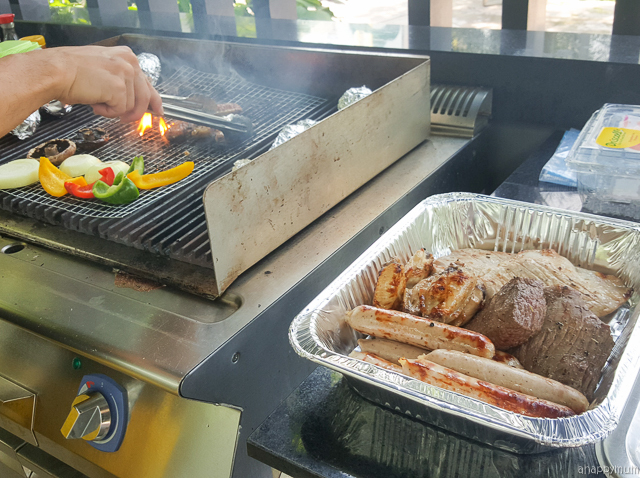 We started off with a bang on Labour Day by hosting a barbecue session at our house. Yumz! 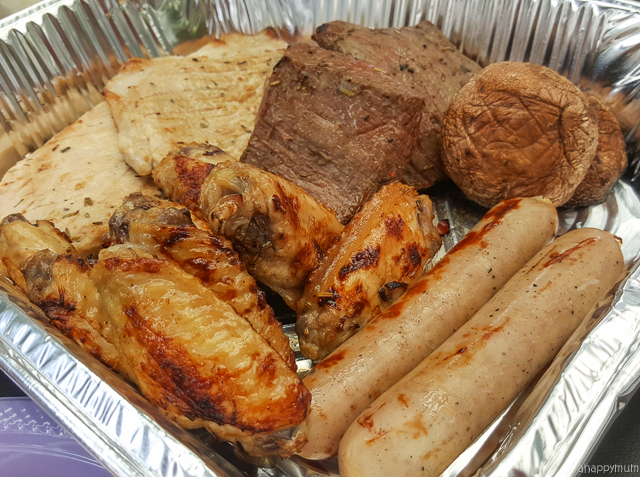 I can't never get enough of BBQ food, can you? It just smells and tastes sooooooo finger licking good! 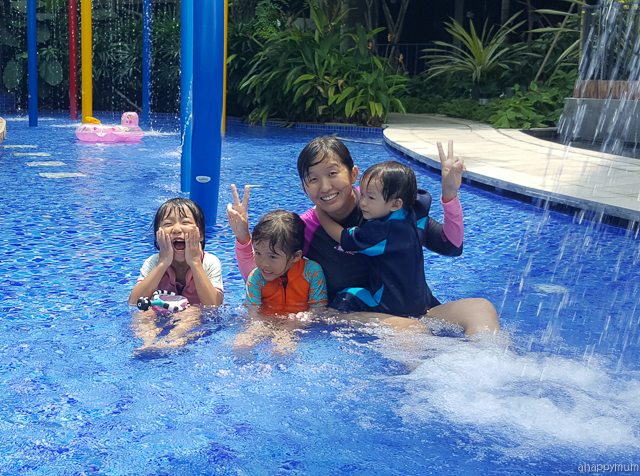 I have to thank the hubby for being so awesome with the food preparation and the peng kan-ing so I could feel totally assured when I took the kids to the pool. What was so awesome was that we had this 0.5m wading pool right beside the pit so yes, the kids got to play in the water (and eat at the same time) while the adults got to chill and do some catching up. 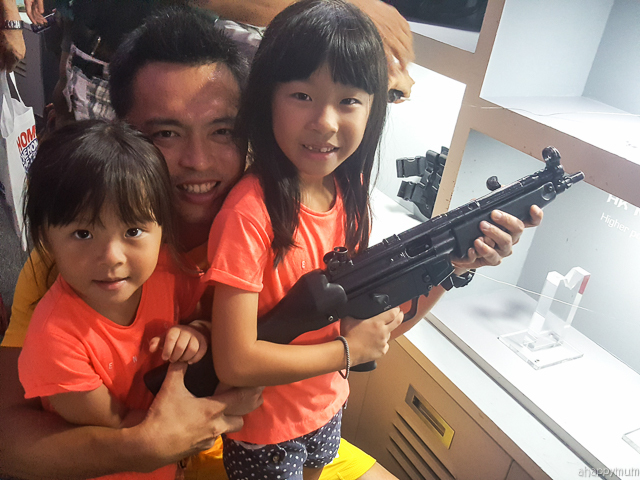 The Home Team Show and Festival was a good chance for us to teach the kids more about our Home Team's strong capabilities, how it works hard to keep our country safe and how we can play our part too. 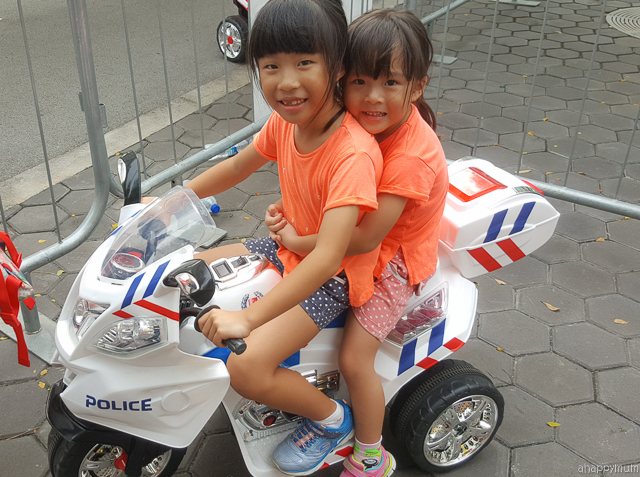 I'm thinking that we really ought to go for more national education shows, exhibits and events like this (instead of indoor playgrounds and shopping malls) because they help to instill a sense of patriotism and make the girls realise how lucky we are to be a part of the tiny red dot. It has been a couple of months since we went for a movie and this month, we watched not one but two! 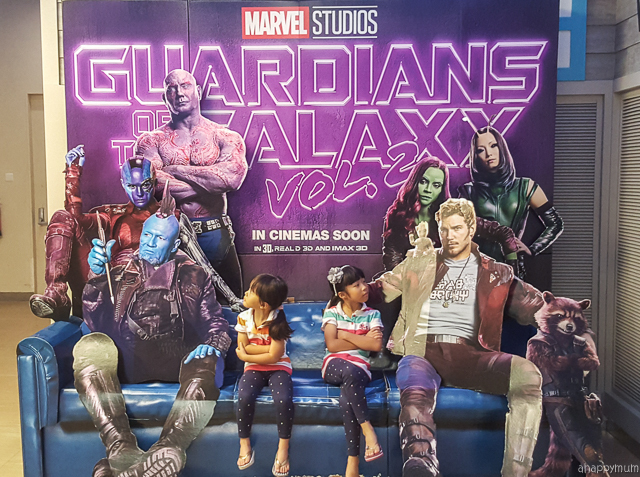 Yup, Guardians of the Galaxy Vol.2 was an awesome show and its exciting, somewhat heartwarming plot on kinship and friendship kept us glued to our seats. Pirates of the Caribbean 5 was the other movie we watched and while I'm not really a fan of Jack Sparrow (though I love Johnny Depp), it was a show that kept us entertained and the kids are now excited to watch the other movies in the series too! 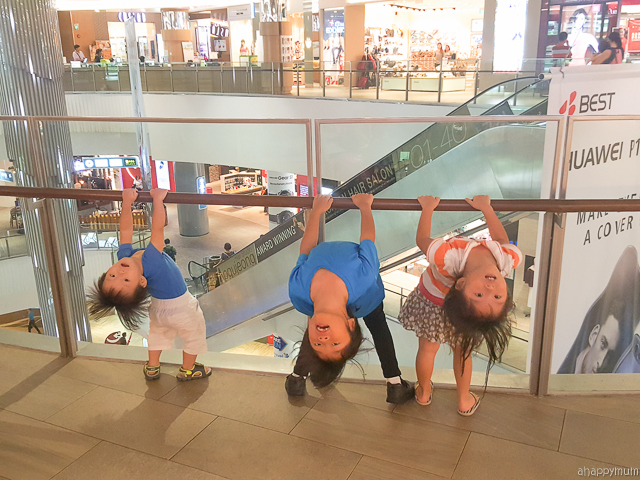 While some people might provide us with goodwill advice not to bring kids to the cinemas, we do it simply because we hope they can adapt to our lifestyle from young, not just us adapting to them all the way. Anyway, it's still a little challenging to bring the 17-month-old who isn't interested in any of the shows, so we just have to try to coincide with his nap time so that the hubby and I can watch as much as possible. 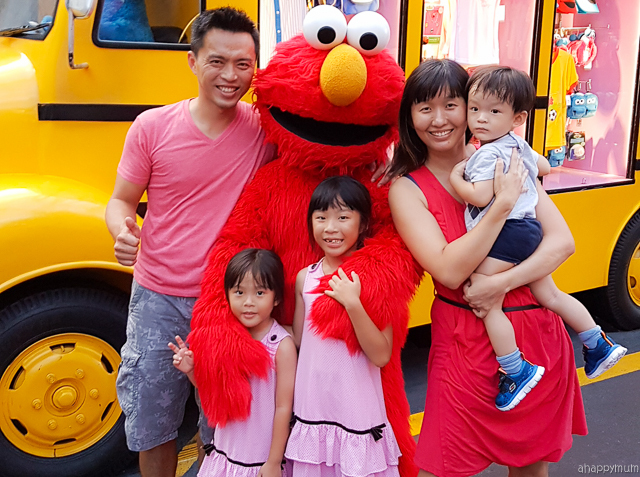 A trip to Universal Studios is always a fun-filled, exciting one and this one was no different. The kids were over the moon at A Chocolate Adventure and had fun decorating cupcakes and cookies, before we spent the second half of the day on the rides and shows in the theme park. 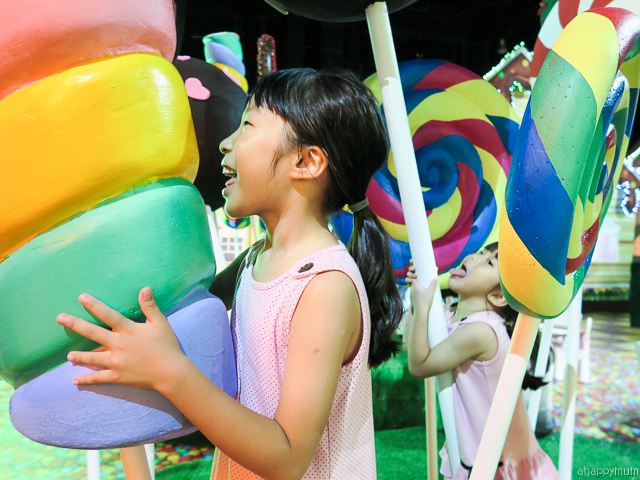 I was so surprised to realise that the little girl has grown so much taller and can meet the minimum height limit for many more rides now! Awwww, it just goes to show how fast time flies and how quickly these little people grow up right? Cherish, mama, cherish. 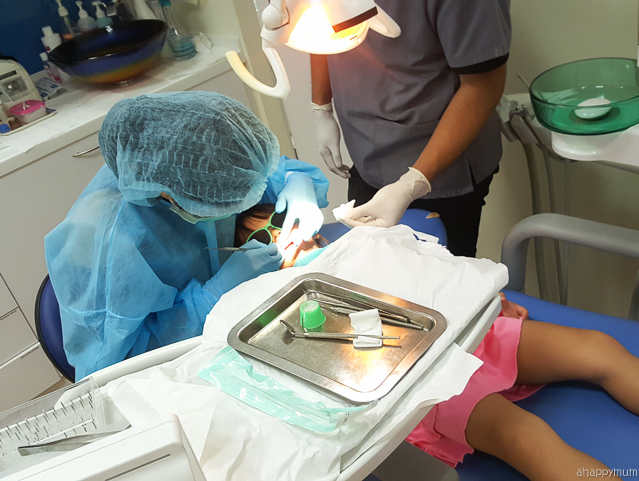 After procrastinating for long, I also brought the girls for a dental checkup at Victoria Dental Care where the dentist kindly explained to them why some of their teeth were dirty and showed them the proper way to brush. 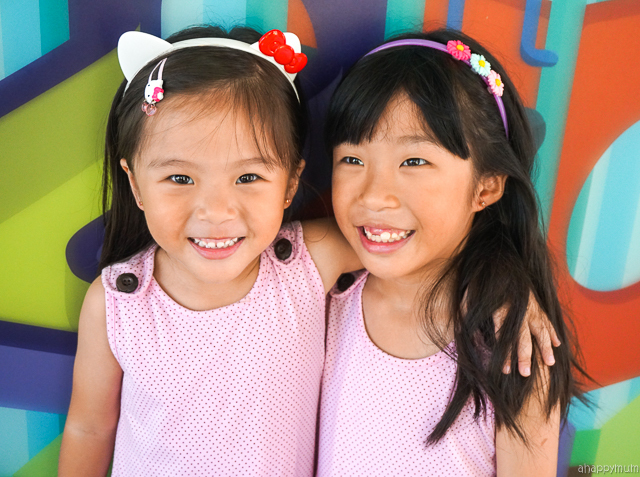 I'm really hoping for them to have good, strong, healthy teeth for as long as possible (but it's hard for us to say no to chocolates and candies, how??)! We still go out every couple of days because this mama doesn't like the feeling of being cooped in the house. 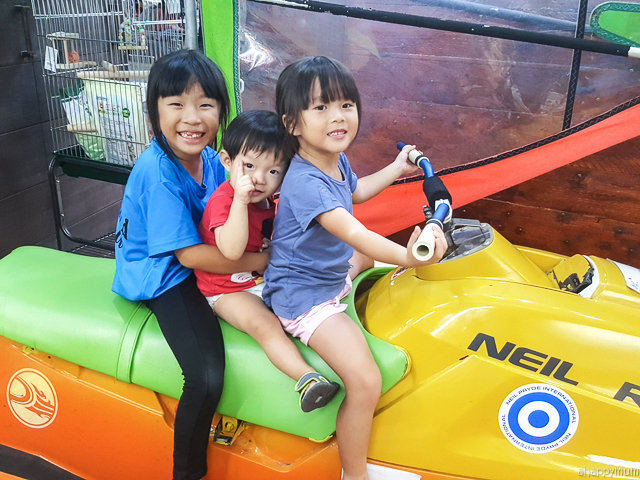 So, we would go for suppers, go for night cycling and scooting, explore new playgrounds in the neighbour, go for ice cream or yoghurt desserts or just go for a walk to take a breather. Yes, it helps to calm me down and make me see things from another perspective, something that I desperately need at times. 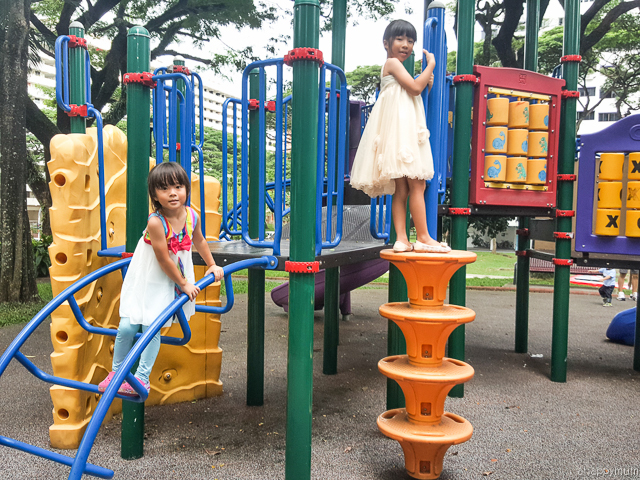 Yes, playgrounds are a great place to hang out and de-stress! When we are there, I'm usually left with just one kid to look after. That is, before the elder two ask me to join them for catching and hide and seek. Nonetheless, it helps to bring out the child in me and it's always healthy for parents to engage in fun playtime with their kids, right? 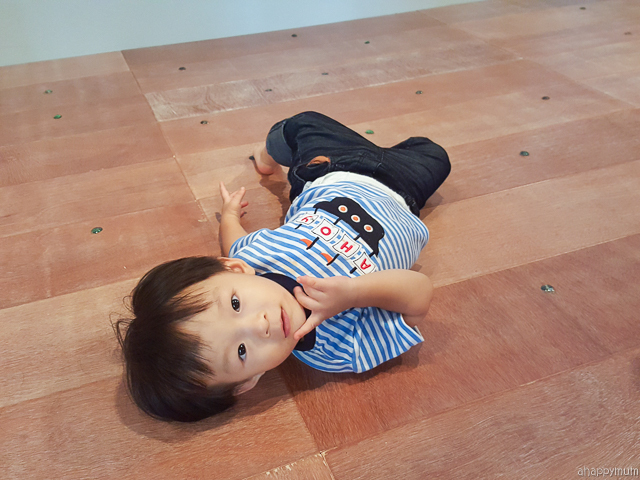 Well, it's just that it's seriously very, very tiring to be carrying a toddler to run around and catch his jiejies, but he loves it and squeals with such delight that it's hard to break his heart and say no. Haha. In terms of homecooked meals, we've had less of those this month, say just 2-3 times a week, because I was just so worn out and tired just thinking about the washing that comes after. 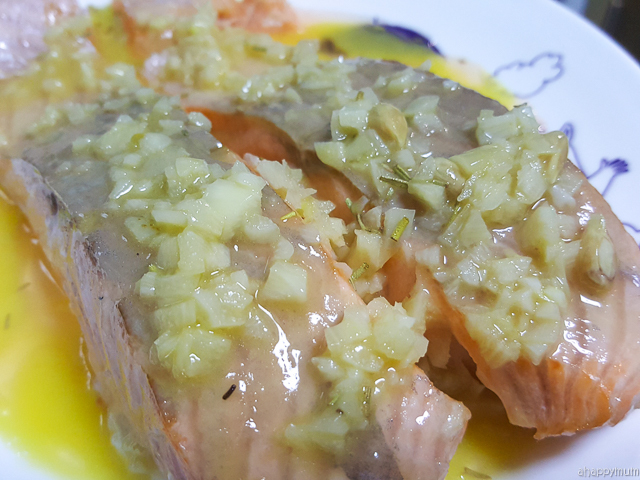 Yup, thankfully the hubby doesn't come home to eat on most weekday nights and thankfully neither he nor the kids will beat me up over it if I say that I did not cook and we need to dabao or eat out. Phew phew phew. So, I guess I just need to get over the guilt myself. Do you realise how many times we mums tend to say the word "Faster, faster!" every day? I know I do that more than needed. Rushing them to eat, to pack, to walk, to sleep, to bathe and more. These days, I remind myself to take things a little slower and to even pause in our steps more often. Yup, sometimes I think we gain more by lying down side by side and doing nothing than to be rushing from place to place trying to accomplish everything. 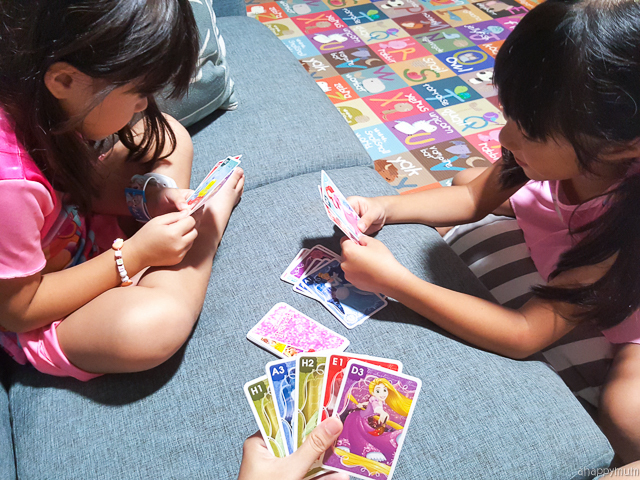 The girls have picked up a few card games and are very excited to play them with, or without, me. Haha. Yup, that's the good thing about having more than one kid. I teach them, and soon they can play with each other on their own while I go get busy with the toddler. We are in love with our Disney card games from Cartamundi and I'll be showing more of them on my social media, so look out for that cos' there will be a giveaway too! 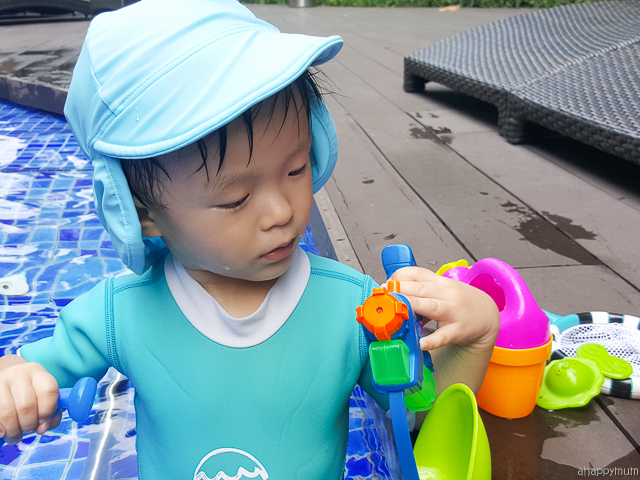 The good thing about our new house is that now we can go for a swim as and when we like and I'm now feeling so confident and happy to bring all three kids into the pool myself, despite that two of them still can't swim. Yup, it makes me feel good to be in the water too and just let it wash my troubles away. 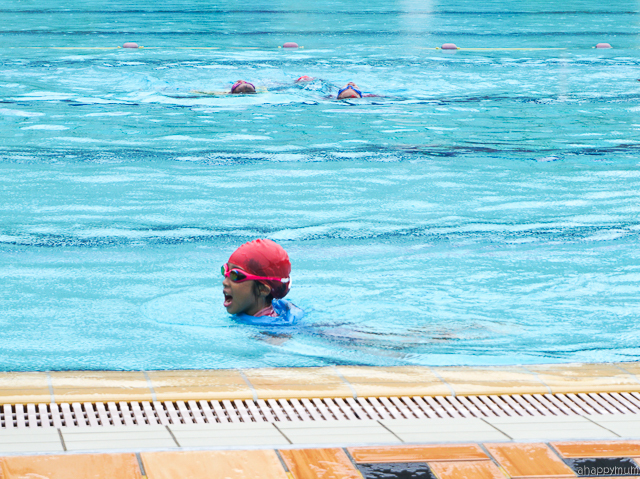 Besides, these water babies are always so delighted to be in the pool and it's hard not to feel their infectious joy. With the school holidays around the corner and so many children activities happening, we decided to fork out some time to visit the museums. 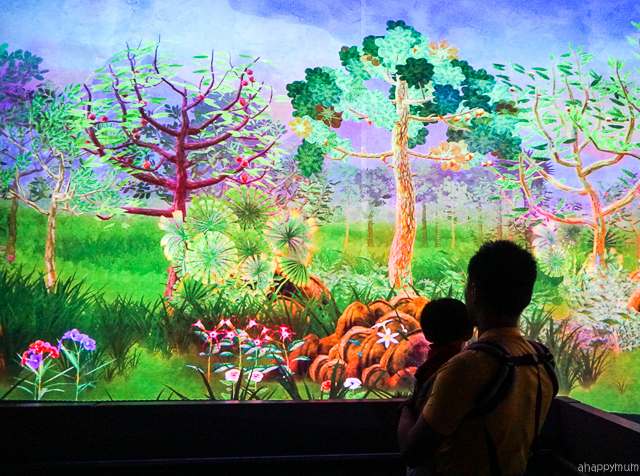 First up was exploring the Children's Season at National Museum of Singapore! It turned out to be better than expected and while I enjoyed going through the trails and finding out more about our Singapore heritage, my favourites turned out to be the Story of the Forest at the Glass Rotunda and the Soft Dome located at the entrance. 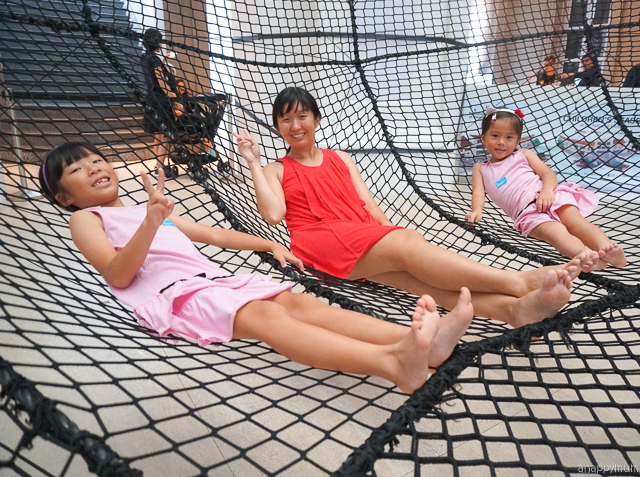 We also made time to visit Imaginarium at SAM @ 8Q and let's just say that this one didn't turn out quite up to expectations and the kids got bored after a short while. I wished they had more interactive and kid-friendly exhibits and activities, but nope, not much as compared to past years. 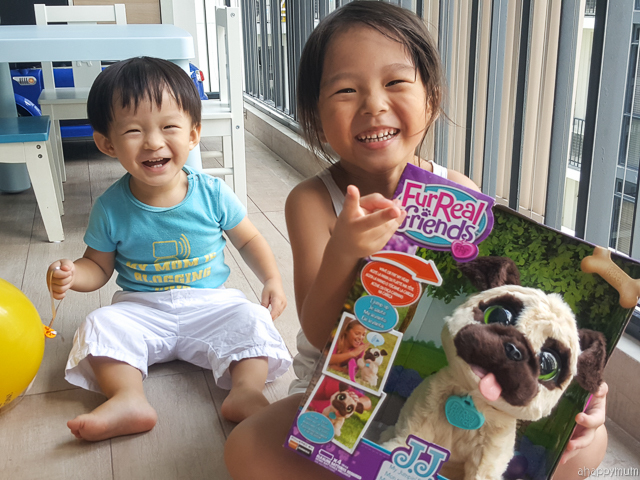 The kids, who have been pestering me for a pet for the longest time, got half of their wish come true when Hasbro sent over JJ, the jumping pug. Yup, this adorable puppy barks, sits and jumps to welcome you, which is bound to make every kid smile. 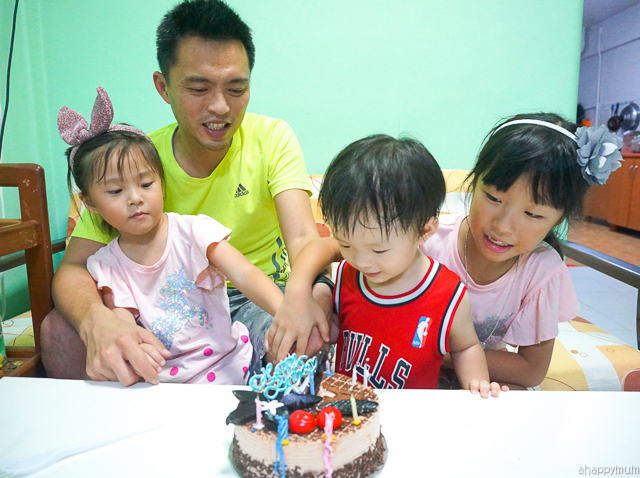 You have no idea how happy these two younger ones were when they met him for the first time! So we might have moved house but the big girl has remained in her previous primary school, which by the way is a neighbourhood school, even though it is now way out of our walking distance. While the hubby fetches her to school, she's been taking the school bus back on 3 out of 5 weekdays. On the other 2, I have to pick her up after CCA which essentially means I have to wake the brother and sister up from their naps to make a 40-minute trip by train down to her school and then make another 40-minute trip back with the entire brood. But you know what? I have zero regrets whatsoever because she is doing so well there and most importantly, she is happy. Like extremely happy. What more can a mum ask for, right? 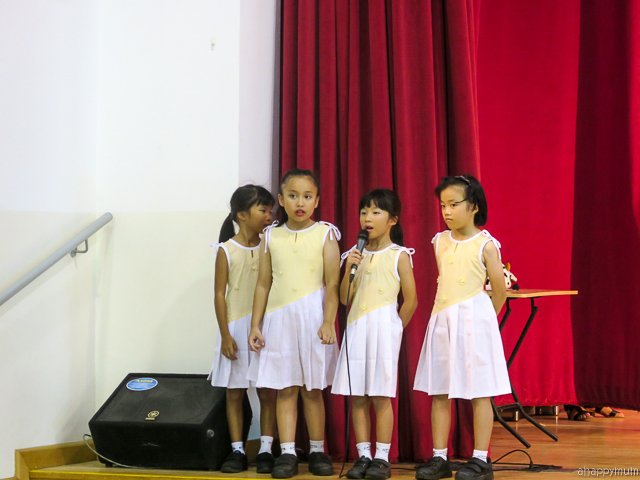 What I love about this school is that there are plenty of events for parents to join in, for instance we went for a music extravaganza where she played the keyboard, we went for a speech and drama performance where she was the narrator for Little Red Riding Hood, and we also had a whole day of fun at a carnival which was held on the last day of school. The carnival had over 20 game stations, complete with bouncy castles and popcorn and candy floss, and I was so impressed by how the game masters were kids from the upper primary and how everything ran so smoothly. 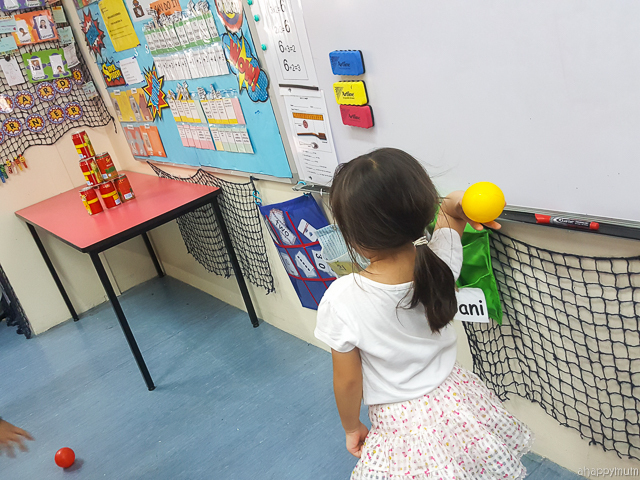 She also reached another milestone after attending a term of swimming lessons with the school and just went for her SwimSafer Stage 2 test! We made sure we turned up to support and cheer her on, which I know meant a great deal to her. Yup, no matter how tough some of our days might be, I hope this girl knows just how much she is loved and how I hope for her to grow up to be a good and kind person. Will pen a letter to her very soon! 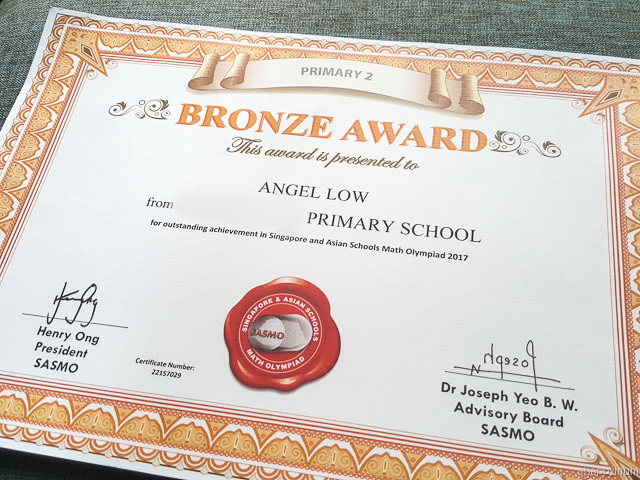 The big girl also took part in her first ever Math Olympiad and since I know fully well how hard it is to strike anything remotely close to bronze (do you believe me when I say I went for this competition yearly all the way from primary to JC level? Yup, Mathematics was my favourite subject! ), I was so surprised when she won this award! Well done, my dear, you surprised me yet again! I'll be showing you more of our balcony next week but guess what I finally achieved? Yippee, I set up a small, cosy art and craft corner! 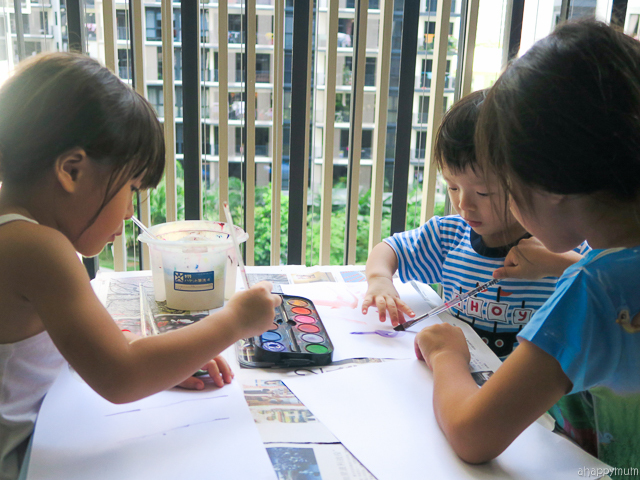 Yes, it's really just a tiny space and using kid sized table and chairs from IKEA, but I'm very happy and thankful for it because finally, it is time for us to get back to our fortnightly art sessions! Woohoo! I also did something that I've wanted to for a long time - I donated my wedding gowns. Yup, they've remained intact in my parent's house for a long time and looking at them reminds me of how much time has passed us by (and how much my tummy and thighs have grown). 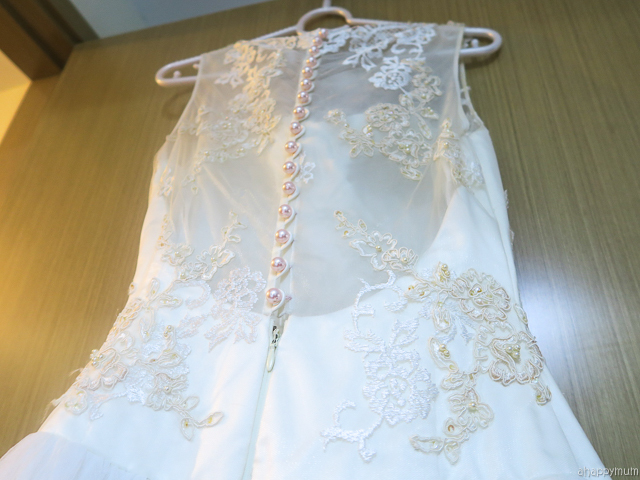 Thanks to Angel Gowns, they will now be upcycled for a meaningful cause and will be turned into beautiful outfits for little angels who have unfortunately passed on. 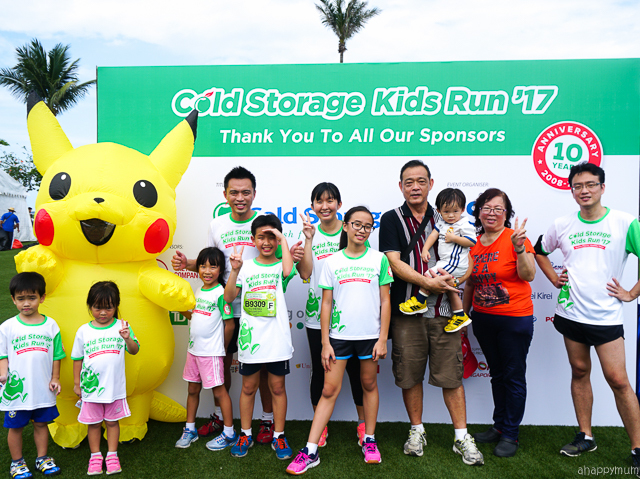 May also marked the Cold Storage Kids Run and we were excited to be part of their 10th anniversary celebration this year! Thanks to the in-laws who came down to Palawan Green with us, the baby boy was in good hands while Angel paired up with Daddy and Ariel with me for their respective 800m run. 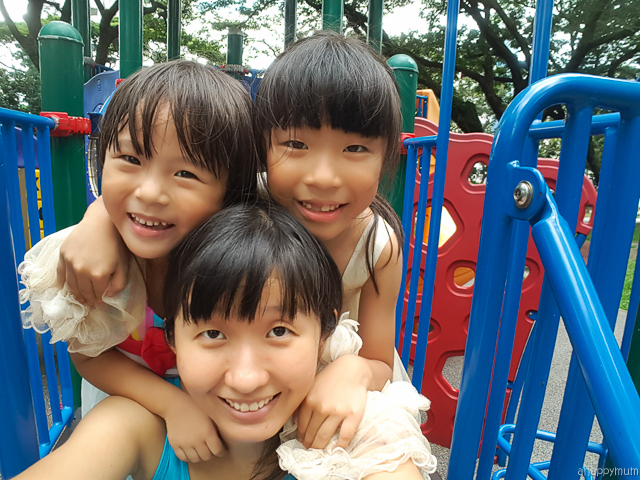 The kids were also very happy to spend time with their cousins on that beautiful Sunday morning too! Will be sharing more on our experience soon! Last but not least, the highlight of May for the girls would have to be their ear piercing and new earrings! Yup, we did this on the hubby's birthday so it will be extra memorable for all of us. (I know, I wonder whose birthday we were celebrating too). I will be doing a short post on our experience so stay tuned for that if you wish to find out more or watch our clip to see how the girls reacted! So you see, they look even more mature now and it just seems to remind me how fleeting the years can be when you are a parent. The next thing I know, they will be teenagers already and I will likely not be the most important person in their lives anymore. For one, at least I am pretty sure we won't be spending so much of our time together and they will probably be resistant to my wet kisses and tight hugs. Awwww. Must that day really come? In between deep breaths, constant self reminders and guilt over unnecessary words and actions, I guess I will find a way to tide over and renew my strength and confidence in this motherhood journey. Yes, I will always get up when I am down, it's just a matter of how and when. The good thing is while the kids are still young, I feel like I am always given a new opportunity to make today better than it was yesterday and for tomorrow to be even better than today. So come what may, I might fall, I might falter, but I will never give up in trying to be a good mum and to raise kids whom I can be proud of.